Geshe Kelsang Wangmo, Manali, India, May 2011. Photo courtesy of Geshe Kelsang Wangmo. 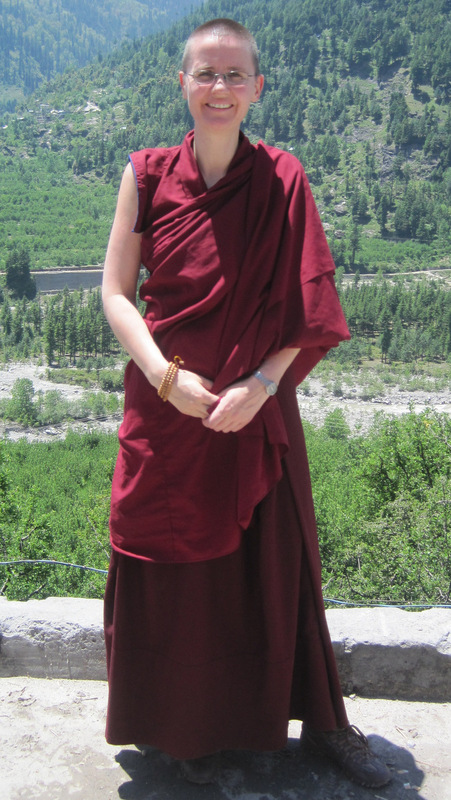 Geshe Wangmo participated in an email interview from her home in McLeod Ganj, India, with Mandala in July 2012. You can read our full story about Geshe Wangmo and the emergence of the female geshe in the print issue of Mandala October-December 2012. Mandala: How did you come to be a student of Tibetan Buddhism and a nun? Geshe Wangmo: I was born and raised in Germany, and after finishing high school and before enrolling in university I decided to take some time off and travel. It was a very confusing time. I did not know what to study, and, even more importantly, what to do with my life. 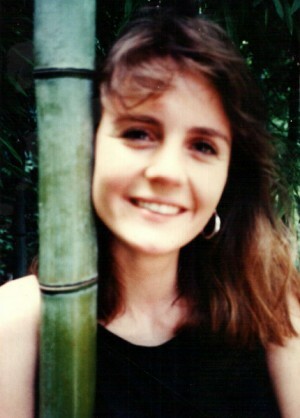 I felt drawn to pursuing medicine, but at the same time had a great interest in psychology, anthropology and languages. Sometimes I wanted to get married, start a family, and settle down near my hometown, while at other times I wanted to be independent and live on a different continent. I hoped that taking time off and traveling would help me make a decision. I set off for Egypt and after that Israel, where I volunteered in a kibbutz for a few months. Then I backpacked through Greece, Turkey and Thailand. When I ran out of money, I spent some time working in Japan before continuing to travel to Indonesia and eventually to India. Geshe Wangmo, as she appeared during her early days in Dharamsala, India, early 1990s. Photo courtesy of Geshe Kelsang Wangmo. When I arrived in Calcutta in spring 1990, it was already quite hot, so I took a train north to Varanasi. After plenty of sight-seeing, heat rushes and dysentery, I traveled on to the hill station Manali, where other backpackers told me about Dharamsala, His Holiness the Dalai Lama, the Tibetan community in exile, and … great chocolate cake. Therefore, I decided to spend a few days in McLeod Ganj before returning to Germany. Arriving in McLeod Ganj in the late afternoon, I felt a little exhausted and disappointed. Even though I had met great people and learned a lot during my travels, including encountering interesting cultures and customs, I still had not found the answers I was looking for. Most of the hotels were booked when I got in. I ended up sharing a double room with three other girls. Going to bed that night, sleeping on the floor, I felt quite lost and unhappy. Upon waking up, however, everything had changed. I remember opening my eyes, seeing a bedbug crawl up on the bedpost next to my head and thinking how happy I was. I felt so happy and peaceful that I decided to extend my visit and stay for a few weeks. Looking back, I think the reason for the dramatic shift in my feelings is that McLeod Ganj – even now despite its countless hotels, restaurants and tourists – is a very special and blessed place due to the presence of His Holiness the Dalai Lama, other great lamas and numerous practitioners. I found a nice room and started to explore McLeod Ganj and its surrounding areas. After a few weeks I signed up for a Buddhist meditation course led by an Indian who was born and raised in the Parsee (Zoroastrian) community of Bombay. As a young man he had developed an interest in Theravada Buddhism, had become a Buddhist and started to give Theravada Buddhist courses with teachings and meditation. The first day of his teachings, which was on the four noble truths, completely transformed my life. Although I had countless questions, the majority of what he explained made great sense to me; it was as if everything fell into place, and I immediately wanted to learn more about the Dharma. Following the course, the Indian teacher organized a one-month summer retreat at Tushita Meditation Centre, which I also attended. During that time, I read Lama Yeshe’s Wisdom Energy which had a great impact on me and drew me to the Mahayana teachings. After the summer retreat, I started to attend teachings by Tibetan lamas such as Kirti Tsenshab Rinpoche, Lati Rinpoche and so forth. In autumn 1990, I went to Kopan monastery in Nepal, attended a course by Ven. 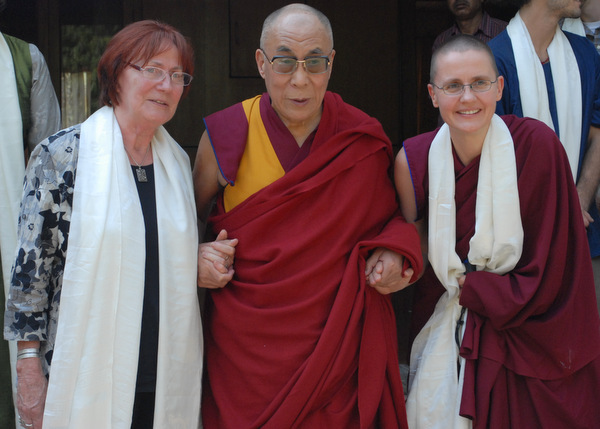 Karin Valham and following that, attended the one-month November course taught by Kirti Tsenshab Rinpoche. By that time, I had developed great faith in Tibetan Buddhism and wanted to become a nun. Having finally found what I had been looking for, I called my parents to explain what I had been doing for the past months and to ask them for their blessing to become ordained. Not surprisingly, my mother got extremely worried since she did not know anything about Tibetan Buddhism and assumed I had joined a cult. “Don’t give away your money!” she warned me for she thought I might have been brainwashed into doing so. She literally got on the next plane from Germany and a day later arrived in Nepal. Once at Kopan, my mother was able to see for herself what I was doing. She met some of the German speaking students and came to understand how much becoming ordained meant to me. Nonetheless, she asked me to wait a few months and, since I had been having an ongoing problem with dysentery, to come with her to Germany to recover. If after that time I still wanted to become a nun, my parents would give me their blessing. Before returning to Germany, my mother and I traveled to Varanasi in order to attend the Kalachakra initiation given by His Holiness the Dalai Lama, although I hardly understood anything, and my mother spent the teaching sessions shopping in Varanasi. In spring 1991, after spending a couple of months with my family, I returned to Dharamsala. I rented a room at Tushita, and took rabjung ordination from Kirti Tsenshab Rinpoche. Unsure of where to go as a newly ordained nun, I decided to stay in the protected environment of Tushita and work in the library. In the monsoon, I attended the three-month Vajrasattva retreat there. 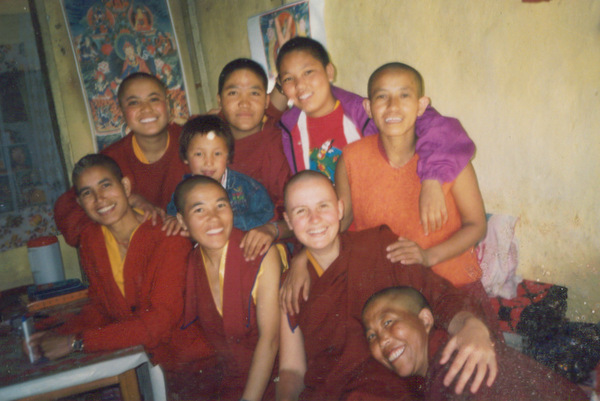 Geshe Wangmo, after her ordination, with friends from Jamyang Choling Nunnery, McLeod Ganj, circa mid-‘90s. Photo courtesy of Geshe Kelsang Wangmo. Where did you meet Lama Zopa Rinpoche? What is your connection to Rinpoche? During all these months I was burning to meet Lama Zopa Rinpoche, having heard so much about him. Unfortunately, he was too busy at the time to be able to come to Tushita. However, after the Vajrasattva retreat I heard a rumor that Rinpoche might be teaching at the Kopan November course. Thus in autumn 1991, I traveled to Nepal and after some time finally met Rinpoche. He taught part of the November course and had an impact on me that no other lama, except His Holiness the Dalai Lama, has ever had. I find it impossible to express the way Rinpoche makes me feel, but just thinking about it brings tears to my eyes. He is one of the most amazing beings I have ever met and has truly changed my life through his profoundly inspiring example and his peerless teachings. After the November course, I took getsul ordination from Kirti Tsenshab Rinpoche together with Ven. Tony Beaumont, Ven. Rita Riniker, Ven. Fran Mohoupt and a few other Westerners. I also had an audience with Lama Zopa Rinpoche, who advised me to do 400,000 prostrations, 300,000 mandala offerings, 200,000 refuge prayers and so on. From Kopan, I went to Bodhgaya to start prostrations. Once the heat became too intense, I continued in Dharamsala where I took a room at Elysium House near Tushita. Initially, I truly enjoyed the quiet and peaceful retreat environment and spending a lot of time on my own. However, I gradually came to see my own limitations, especially since I had so little understanding of the Dharma and so many questions. That is when I decided to learn Tibetan and take more teachings. Lama Zopa Rinpoche teaching at Tushita Meditation Centre with Geshe Kelsang Wangmo in attendance, McLeod Ganj, India, May 2012. Photo courtesy of Tushita Meditation Centre. After receiving permission from Lama Zopa Rinpoche and Kirti Tsenshab Rinpoche, I set out to find a Tibetan teacher. A friend of mine, a Tibetan nun who is the niece of the late Gen Lamrimpa, told me about a very learned and experienced teacher from the Institute of Buddhist Dialectics, Geshe Gyatso-la. The next day I went to see him and asked him to teach me Tibetan. He replied, “I will teach you how to debate because that is the quickest way to learn Tibetan.” Seeing as I did not know anything about debate and wanted to learn Tibetan as fast as possible, I was thrilled. This is how I was introduced to the highly effective tool of debate. When did you enter into the geshe program? Can you describe what is involved in pursuing a Geshe degree? Was that made more difficult because you are female? I found the technique of debate so helpful that in 1993 I signed up for the new class of the geshe study program at the Institute of Buddhist Dialectics. At the time, I did not know exactly what the program involved and how long it would take. I actually thought that because it was described as very demanding and difficult, I probably would not last long. I therefore decided to study for about two years, hoping to be able to learn enough to be able to read the scriptures and receive direct instructions from Tibetan teachers. As I knew that the majority of my classmates would be male, I also looked into the possibility of pursuing my studies at one of the nunneries. However, at that time, Tibetan nunneries did not admit foreign nuns in their study programs since they could hardly accommodate and feed their own students. Dolma Ling consisted of a few nuns who were crammed together in a small Indian building near the place where their nunnery is located now. There were only about 12 nuns at Jamyang Choling and they lived in renovated cow sheds in McLeod Ganj while in the process of purchasing land for their new nunnery. Even though Ganden Choling in McLeod Ganj had already established a proper institute, they were extremely overcrowded with new nuns arriving from Tibet on an almost daily basis. Finally, due to visa restrictions and similar circumstances in the remaining nunneries in India and Nepal, I decided that the Institute of Buddhist Dialectics was the best place for me. Initially, my class consisted of more than 40 students, the majority of whom were Tibetan monks. We also had quite a few foreign students, but unfortunately after a few months, most of them left the class, except for a British monk (Ven. Josh Gluck) and a layman from the United States (Don Eisenberg), both of whom continued for about 10 years. Our study curriculum is based on the curriculum of Drepung Loseling Monastery; we use the same scriptures and most of our teachers were trained there. The first year we studied Collected Topics (Tib. : due tra), Awareness and Knowledge (Tib. : lo rig), and Signs and Reasoning (Tib. : ta rig). Then for the next six years, we studied the Abhisamayaalamkara by Maitreya, which is also referred to as the study of the Prajñaparamita Sutras (the Perfection of Wisdom Sutras). Following that, we studied for three years Madhyamaka (the Middle Way), two years the Abhidharmakosha (Treasury of Knowledge), and two years the Vinaya (Discipline). 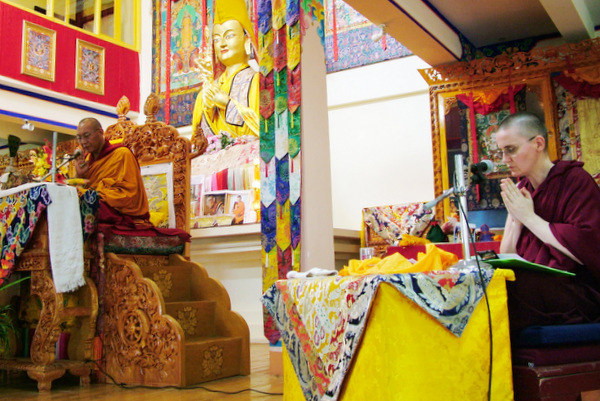 Given that the institute was founded by His Holiness the Dalai Lama who wants students to receive a rime, or non-sectarian, education, we also spent three semesters studying and debating the other three Tibetan traditions. Our institute invited a khenpo from Namdroel-ling for the Nyingma tradition. After that we spent one semester at Dzongsar Shetra for the Sakya tradition and one semester at Sherap Ling for the Kagyü tradition. The last two years of the program we studied Lama Tsongkhapa’s The Great Stages of Tantra (Tib. : nga rim chen mo). Except for Sundays, we usually had an hour and a half of class and about four hours of debate every day. At the end of each year, we had to take written and debate exams. After we completed the Abhisamayaalamkara/Prajñaparamita sutras, we took numerous different written and debate exams testing us on the entire six years of the topic. We were similarly tested after completing the study of Madhyamaka. For the remaining years, we annually had to take three to four exams and at the very end submitted a 50-page thesis in Tibetan. Our class was very fortunate because many of my classmates came from Sera, Drepung or Ganden Monasteries, where they had already studied for many years. They were sent to the Institute of Buddhist Dialectics by their teachers in order to study English or Tibetan grammar, or because they had health issues due to the hot climate in South India. Even though some of them were already very advanced, the institute’s rule at the time was to enroll everyone in the beginner’s class. This proved to be of great advantage to the rest of our class because during debate, one basically learns from one another. Furthermore, some of us had the fortune to spend our winter vacations at Drepung Loseling Monastery to further our studies. In the beginning, I was even allowed to participate in the debate with the monks there. Nonetheless, I found the first 10 years extremely difficult. Due to the language barrier and the cultural differences, I was often confused and bewildered, not understanding why things were done in a certain way. On top of that, Tibetan not being my native language, I had to work incredibly hard to not fall behind. Even more difficult than those challenges was the fact that I was the only woman in my class. The study program was so demanding and time-consuming that it was nearly impossible to maintain social contacts outside of the program. Therefore, any interaction with other people took place on the debate ground, in class, when we got together to prepare a debate and so forth. Even though my classmates were extremely close to each other, they tried to be good monks and did not want to spend time with a nun. I was only close to maybe one or two of my classmates who would occasionally come to see me and cheer me up. At times, I was so lonely and miserable that I did not know how to get through the next months. I think it is primarily due to the kindness of my amazing teacher Geshe Gyatso-la that I did not give up. Whenever I had a problem, I could go to see him. He would help me with my studies, explain difficult points, give me advice and encourage me to continue. On top of that, it was also the joy of doing the studies that kept me going. Studying and debating the sacred Buddhist scriptures has given me a deep sense of happiness and satisfaction. It has made my life so much more meaningful and set my mind in the direction of the Dharma. This is why, despite the hardships, I do not regret even a single day of the last 18 years. I took my final exam at the end of 2009, and about a year later submitted my 50-page thesis. The topic I chose for my thesis was dependent arising. 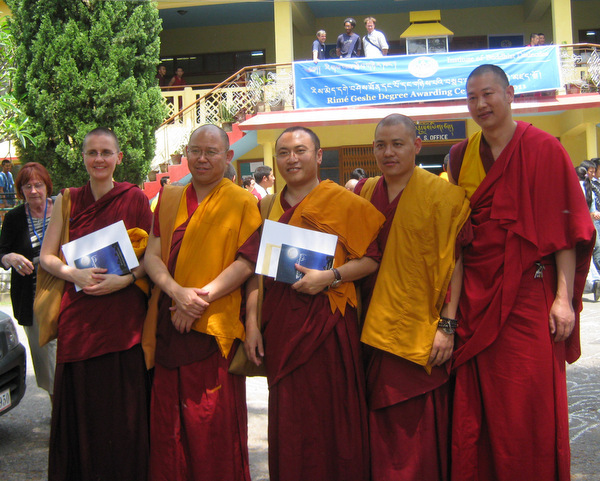 Geshe Kelsang Wangmo with her classmates after their graduation ceremony, April 2011, Dharamsala, India. Photo courtesy of Geshe Kelsang Wangmo. Although I was told that the Institute of Buddhist Dialectics was working towards receiving permission to give the Geshe degree to those who had successfully completed the program, I did not believe this would happen any time soon since traditionally only Sera, Drepung and Ganden can give the degree. Many of our monks were actually able to get their Geshe degree at Drepung Loseling Monastery because, upon having completed all of their exams at the Institute of Buddhist Dialectics, they merely had to spend some time at Drepung, go through some formalities (such as officially joining Drepung Loseling Monastery, etc. ), and within a few weeks received the degree. However, since only monks can join a monastery, this is not an option for nuns. Therefore, the Institute of Buddhist Dialectics made great efforts to be able to give the degree to all of its students, including the nuns. In April 2011, it finally happened: permission was granted by His Holiness the Dalai Lama and the Ministry for Religion and Culture. In an elaborate ceremony, my classmates and I, together with the students of a senior class, were given the Geshe degree. Although this was slightly controversial, a number of Tibetans have told me that it was instrumental in paving the way for nunneries to be able to establish the Geshe degree for nuns. Starting next year, nuns from the Gelug nunneries in India and Nepal who have completed their study program will have the opportunity to review their studies and take exams for another four years. Upon successful completion, those nuns will become geshes. What advice would you give to a nun entering a geshe program? My advice for nuns entering the geshe program would be not to be intimidated by the many years that lay ahead, but instead, to take it a day at a time. Most important is to prevail and not to give up. I am confident that if a nun as average and ordinary as myself can do it, any nun can do it – if she just hangs in there. 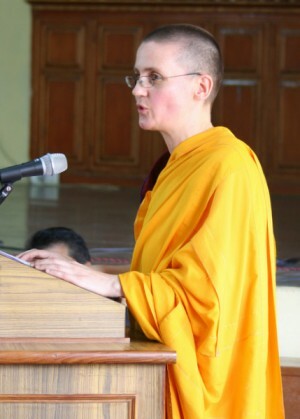 As Buddhism is slowly spreading and, hopefully, taking roots in the West, we need more Western monks and nuns who have done in-depth study and debate of the Buddhist scriptures and who are able, without having to rely on a translator, to pass on their knowledge to other Westerners. Furthermore, without a good grasp on the Buddhist teachings, it is very difficult to engage in meaningful practice. Geshe Wangmo speaking at the Rime Geshe graduation ceremony, April 2011, Dharamsala, India. Photo courtesy of Geshe Kelsang Wangmo. In fact, one should not regard Buddhist study as being separate from spiritual practice, but as an integral part of it. Many geshes explain study and debate as an analytical meditation, in the sense that one listens to the teachings, contemplates them during the debate and immediately makes an effort to become familiar with them so as to be able to integrate them in one’s daily life. Now that you have finished the geshe program, how do you spend your time? Even after finishing the geshe program, I am still spending a great part of my day reading the scriptures. Sometimes I review what I studied and sometimes I read texts that I previously did not have the opportunity to read. I also listen to teachings, go to see my teachers to ask questions and so forth. A few years ago I started to teach the Abhisamayaalamkara/Prajñaparamita sutras in English. Every spring and autumn I teach a group of Westerners for about two months at the Institute of Buddhist Dialectics, gradually covering all of the topics the way they are covered in the monastic institutions. However, since there is not much written material available on this particular subject, I spend a lot of time translating parts of our texts and preparing handouts. Every year in the spring I also teach Buddhist philosophy to a group of students from Emory University in the United States who attend a study abroad program at the Institute of Buddhist Dialectics. Eventually, I would also like to go into longer retreat. 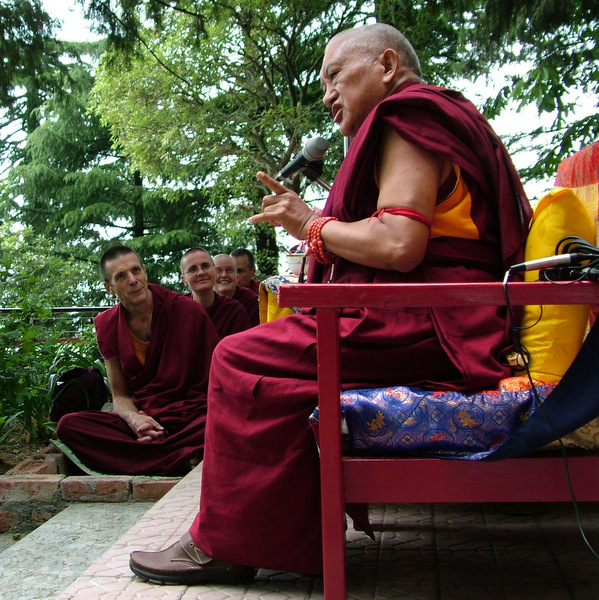 Geshe Wangmo interpreting for Dagri Rinpoche, Tushita Meditation Centre, McLeod Ganj, India, June 2012. Photo courtesy of Geshe Kelsang Wangmo. Have you been teaching at Tushita Meditation Centre or will you? For the past 20 years I have felt a very strong connection with Tushita Meditation Centre, since it is the first Buddhist center where I received Dharma teachings. Over the last few years I have sometimes given short teachings at Tushita and have done some translations for some of the lamas during initiations. Recently, Lama Zopa Rinpoche visited Tushita and I had the great fortune to receive some of his teachings and have an audience with him. I had not seen Rinpoche since 1991 and being in his presence affected me very deeply. It is as if everything I learned during my studies came alive in the form of his person. At that time Rinpoche’s attendant, Ven. Roger Kunsang, asked me to teach in one of the FPMT centers. However, since I feel very committed to be of service to the Institute of Buddhist Dialectics, which has shown me such great kindness and support, I cannot leave Dharamsala for the time being. Therefore, I decided to offer my services to Tushita, where Ven. Kunphen is planning to organize a course on the mind, i.e., Awareness and Knowledge (Tib. : lo rig) for next year. Was teaching something that you thought you might want to do when you first started studying Dharma? When I first started studying the Dharma, I was not thinking much what I would do in the future. All I wanted to do was to learn more about this uniquely vast and profound philosophy. You can read more about the emergence of the female geshe and our full story on Geshe Wangmo in the October-December 2012 print issue of Mandala. Learn more about Tushita Meditation Centre and the programs offered there by visiting Tushita online.